Berlin: a city saturated with so much heavy history that, at the same time, feels young and alternative with its international reputation for street art and off-beat dressers. What culinary curiosities could such a city hold? Here is my report of 5 days eating like a Berliner. An evaluation of the city’s gastronomic offerings would not be complete without mentioning currywurst, the strange mix of ketchup and curry powder liberally poured over sausage, and usually served with fries or bread. Currywurst stands are ubiquitous in Berlin, like Starbucks in the US (and sadly a growing amount of the world), and it is an excellent option for budget travelers, as the average cost for a serving is between 2.50-3.50 euros from a take-out stand (don’t bother with any currywurst over these prices- there really isn’t such thing as a gourmet currywurst). Interesting tidbits about currywurst: it was invented as early as 1949, by a Herta Heuwer in Berlin, who obtained curry powder from the British soldiers in the city at the time, and concocted her unique mix. The currywurst first became popular among the many construction workers rebuilding post-war Berlin. 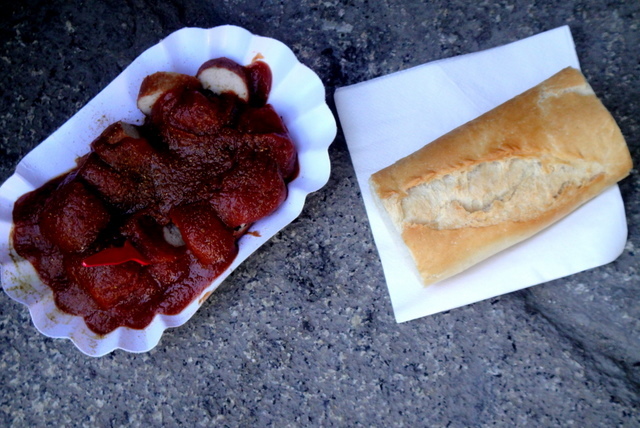 Coming from a background of summer BBQs, I found currywurst comfortingly familiar on one hand, and satisfyingly spicy on the other, as we are deprived from spice in Spain, it is always treat to find it in other places. 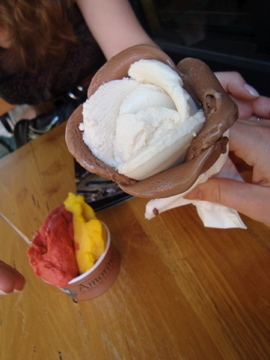 I recommend always going for the cone- where else can you get an ice cream flower? On the sweet side of the spectrum, Amorinos ice cream has been a delicious discovery. 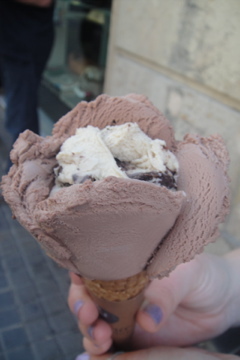 This franchise with shops in many European cities serves gelato in vibrant flavors and with creative presentation. It is the best ice cream I’ve had in Europe this year. For now, they only have a shop in New York stateside, but I figure its only a matter of time before they expand to the West Coast. One of their flavors is an Ecuadorian chocolate with 70% cocoa content, it is swoon-worthy! White asparagus was the talk of the town while we were in Berlin. Germans are crazy for their white asparagus, and its brief season serves to heighten their passion to an obsession. Stands devoted exclusively to fresh white asparagus dotted the roads around Berlin. 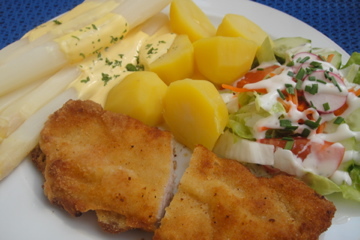 Julia and I had some in hollandaise sauce with an Austrian classic, schnitzel. While the asparagus was really yummy, I didn’t find it too different from our California variety. However, it was refreshing to indulge in some vegetables as we spent most of the trip steering clear of any potentially e. coli-bearing veggies! I hope they will get to the bottom of that mystery soon! 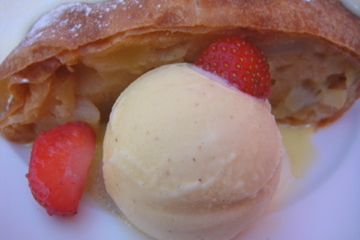 We had a glorious apple strudel in Potsdam, which was overstuffed with a super juicy filling and had delicious accompaniments of vanilla sauce and vanilla ice cream. 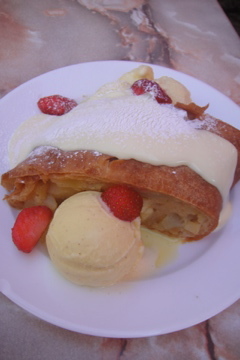 Unfortunately the popularity of apple strudel has spawned many unfortunate bland bakery varieties, but this strudel served in the leafy patio of one of Potsdam’s chic cafés is worth a gastronomic expedition from Berlin (as are Potsdams’ impressive Prussian palaces). Potsdam offers a peak at the slower-paced small town life outside of the hectic city of Berlin that takes place amidst the shady covering of German fairy tale forests. Trip conclusion: Berlin has no shortage of things to do, nor things to eat. I recommend a visit!